Manual lifting work can be hot work even in the coolest environments. 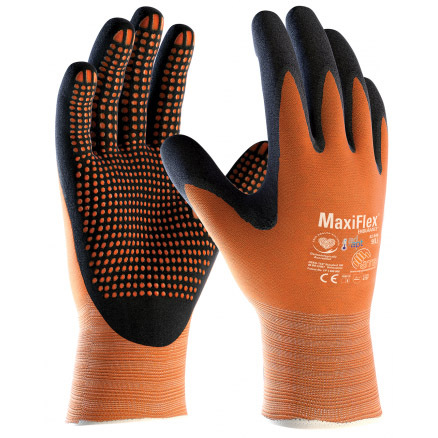 The MaxiFlex Endurance AD-APT Dot Grip 42-848 Gloves use AD-APT technology to keep hot hands cool, dry and productive. AD-APT is activated by the movement of your hands and increased temperature within the gloves. The technology then releases a natural cooling agent to keep your hands dry and cool. These are designated Category II gloves, meaning they should be suitable for most medium-weight tasks. The gloves provide the highest level of abrasion resistance possible, making them ideal for handling tasks that require protection against this hazard. The AD-APT Dot Grip Gloves are available in six sizes to fit most hands. Please measure the circumference of your hand around the knuckles (excluding your thumb) with your palm open and your fingers together. Next, measure the length of your hand from the tip of your middle finger to your wrist.